Attention fans of the macabre and the horrific! Southend’s very own Horror-on-Sea Film Festival returns this year, bringing chaos and disorder to the big screen at the Park Inn Palace Hotel. 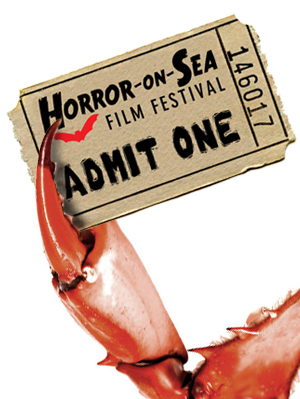 Whether it’s nerve-shredding blood and gore, monsters on the loose or something eerie and creepy that you crave, Horror-on-Sea is the place to be! There are 18 films, with supporting shorts, over the three days of mayhem. Excellent value Day Passes will save you money, but the ‘Big News’ is the Weekend Passes, which will save you a massive £40 off the total ticket price. These are on sale now. But hurry: there are only 100 available! Look if you dare, and we’ll see you in January! Previous PostPrevious Fake Blood, Real Guts! Next PostNext FREE for a limited time! Zero-Budget Horror Filmmaking Masterclass!